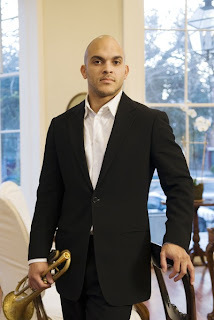 When Irvin Mayfield was named artistic director of jazz at Orchestra Hall in July 2008, he was also commissioned to compose a new work to be performed by orchestra and jazz quintet in July 2009. Orchestra-with-jazz has been done before; examples that come to mind are Wynton Marsalis’s All Rise, Roberto Sierra’s Concerto for Saxophones and Orchestra, commissioned by the Detroit Symphony Orchestra with James Carter, not yet recorded; further back, Bill Evans Trio with Symphony Orchestra, The Modern Jazz Quartet & Orchestra—what else? Please comment if you know about more. Word is that Mayfield’s The Art of Passion will be worth hearing. At the tender age of 31, he’s an experienced composer; conductor Andrew Litton is a jazz fan (the two become best friends at the Dakota last week when they came to hear Tia Fuller play); and everyone wants this to work. Someone at Orchestra Hall who’s heard bits and pieces says it’s beautiful. I interviewed Mayfield last week for MinnPost. Here’s more from that conversation. I was at a concert when a young lady came up to me and said she had been a clarinet player in high school and wished she had kept playing. All over the world, people say, “I wish I had kept playing.” I started thinking about, why did I keep playing? This turned into a global conversation about what it takes to be a musician—what it takes to be so many things in life. You can’t be great in music unless you’re passionate. You can’t have a great life if you’re not passionate. I think what happens—why a lot of people stop and don’t follow their passion—is they get to the not-fun factor. You get the instrument, have to practice, and have to do a bunch of technical things that rob you of the romantic ideal you had. If you don’t know what you’re passionate about and you’re looking for something, investing in other people’s passions can be a great catalyst. Coming to Orchestra Hall is one way you can start investing in other folks’ passions and start becoming passionate yourself. We need passionate people today, because it’s going to take passion to meet the challenges we’re dealing with as humans, from the educational system to global warming to where we need to go as a society, as Americans. A lot of these challenges are going to require the same tools this orchestra puts in place on stage. People overlook and trivialize what great things the orchestra is doing. One of the things I think is really hard right now in America is for people to understand love. We assume we don’t have to teach love, we assume we don’t have to use tools to give people an opportunity to develop love. We’re at a real loss. People have a hard time knowing how to love things and understand what that means. You understand love when you can fall in love with something every day. It’s not just about relationships, but about careers. Folks in my generation will have 13 jobs over their lifetime. This is not a good thing…. I’ve had to fall in love with playing music every day. You get to a point where you have assistants, a career, commitments, you don’t have to worry about money, and it’s easy to forget the real purpose of why you’re doing it. The passion can elude you. You have to make an effort to remember why you’re doing this every day. How many hours a day? That depends on what I need to practice. Obviously, if I’m writing a commission, I’m practicing writing and the trumpet goes down. If I’m working with students, I’m practicing techniques so I can add value to their experience. Practicing can be used for many different things, not just picking up the trumpet. What needs to happen with jazz is the same thing that happened with the culinary arts. Fifteen years ago, nobody wanted to be a chef. Then came the cooking shows, and cooking became the center of what was going on. And it’s not about celebrity or personality—it’s about can they cook. Irvin Mayfield Quintet with the Minnesota Orchestra. Andrew Litton, conductor and piano. Irvin Mayfield, trumpet; Ronald Westray, trombone; John Chin, piano; Neal Caine, bass; Adonis Rose, drums. Thursday, July 23, 7:30 p.m., Orchestra Hall ($45/$65 VIP). Tickets online or call 612-371-5656.